In 1976 Dr. E. Michael Molnar made a pledge, after his father had prematurely died, to devote his life into finding therapies that could have saved his father. Since then Dr. E. Michael Molnar has done exactly that. He was introduced to Dr. Franz Schmid, Professor of Pediatrics, at Heidelberg Medical School, in Germany. Dr. Franz was considered, by most, to be the "Expert of cell therapy". For 15 years Dr. Molnar trained under Dr. Schmid. For 27 years now, Dr. Molnar devoted his time to cell transplantation. In the acknowledgments of his book Cel Transplantation he lists all those who made a huge impact on his life, and knowledge on the subject. Since 2003 Dr. E. Michael Molnar has been recognized as the foremost living authority on the subject of cell therapy. And has been a very big part of Swiss Cell Therapy PTE. Up until now, xenotransplantation has been used in over 99.7% of approximately 5 million patients treated by cell transplantation, over a period of seven decades, while the remaining 0.3% of patients have had allotransplantation. Due to the error of small numbers, it is hard to statistically evaluate the benefit of the newest forms of cell transplantation, i.e. umbilical cord blood cell transplantation and human embryonic cell transplantation, in actual clinical practice. Xenotransplantation is transplantation of cells, tissues or organs between species, i.e. from animal to man, from man to animal, or from one animal species to another, such as from dog to cat, from cat to rabbit, etc. Allotransplantation is transplantation of cells within the same species, example from one man to another, or from one dog to another, etc. These are also known today as autologous adipose cells, or fat cell therapy. Auto-transplantation is a transplantation from one part of the body to another of the same member of animal kingdom, i.e. to take a piece of skin from the abdomen of the patient and transplant it to the finger tip lost in an accident, or to take an adrenal medulla of a patient and transplant it to the striatum of his brain to treat his Parkinson's disease,etc. There is not much difference between cell xenotransplantation and allotransplantation in clinical effects. This fact was recognized by Dr. P. Niehans in the 1930's and by all major figures of German cell therapy in the 50's and thereafter. For that reason the west European cell therapists were not concerned about their inability of prevailing ethical, moral, and religious attitudes in European countries. Human cell transplantation, i.e. allotransplantation, is not, and will not be better or superior, to cell xenotransplantation as the therapeutic tool in human medicine, until human beings will be kept in closed colonies, and euthanasia will be permitted in the preparation of human fetal cell transplants, which is (hopefully) unthinkable. The use of frozen superfluous, redundant, or not needed, human embryos from infertility clinics is another form of euthanasia. At this moment there is only one incurable illness, where human fetal brain cell transplants may be necessary for cell transplantation, i.e. Alzheimer's disease, in all other instances cell xenotransplantation will give the same, if not better, clinical results. Fat Cell Therapy or autologous adipose cells are a form of therapy for a set of very specific treatments, usually of the cosmetic variety or vanity treatments, as we like to refer to them. Results have been seen with Breast Augmentation procedures, and Face Lifts. The cells harvested from the micro liposuction procedure (autologous adipose cells) are not in fact root cells. They are simply cells which can be used to help build or awaken other cell types in specific organs or tissue. They are also as old as the patient is. Experienced scientists and clinical specialists in the field of cell transplantation doubt that embryonic cell transplantation, that currently by erroneous definition means "human" embryonic cell transplantation, could be of any value in the actual treatment of human diseases. But even if it would be, there would be, there would be serious questions about what is really helping the patient: human embryonic cells or the feeder mouse cells without which the human embryonic cells cannot survive in a laboratory dish. Is it just a feeding or is it in reality a co-culture of human embryonic cells and mouse feeder cells? And what is the outcome of such co-culturing? This is an important question that needs to be answered. Dr. E. Michael Molnar and our team studied the poor results in human embryonic/fetal cell transplantation (or neurotransplantation) for Parkinson's disease. With permission from the Ethics Committee of the Russian Ministry of Health, the transplantation of brain cells of various genetic mutants of Drosophila (fruit flies) to moribund patients after severe gunshot injuries of the brain was carried out, followed by a detailed autopsy. There was no clinical effect from such neurotransplantation but also no histologic evidence of any harm. Earlier we alluded to a classical microphotograph of the human product of conception at the stage of blastula with 107 cells, of which only 8 cells become the embryonic cell, while the remaining 99 cells differentiate into trophoblastic cells of placenta. At that point of development all these cells are the same and those that become trophoblastic cells have the same potential for growth and development as embryonic cells. 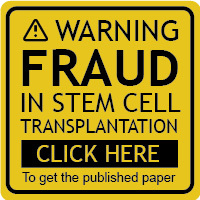 If scientists believe in superiority of human embryonic cells over precursor cells they have to turn the attention to the trophoblastic cells where they encounter much less moral, ethical, and religious outrage, and follow the path so well lit for them by over 20 million patients that received trophoblastic cell implantation. Dr. E. Michael Molnar's research focus is on animal trophoblastic cells, specifically that of rabbits. Most of knowledge in the field of human embryonic cell transplantation has been obtained from mouse embryonic cells. Besides karyotyping, there are no dramatic differences between human and mouse embryonic cells, and 99% of human genome can be found in the nucleus of mouse cells. The case is exactly the the same with rabbits, and rabbits are far a superior species. In the field of cell transplantation it makes very little difference whether one is dealing with xenotransplantation or allotransplantation in terms of the science. But there is an enormous difference in actual medical practice. With cell xenotranspantation we can treat hundreds of thousands of patients now and today. While with cell allotransplantation only a few hundred, or perhaps a thousand patients can be treated in a year. Cell xenotransplants can be manufactured in nearly limitless quantities, and ultimately at a much lower cost. It has been known since 19th century, and the entire modern cell biology is based on the fact that, all eukaryotic cells in Nature are built and function according to the same laws. In clinical practice of cell transplantation we have been dealing with eukaryotic cells (of mammals) only. Main cells of the same organ or tissue are the same in Nature, (or nearly the same), regardless of the species of origin, i.e. corresponding cells of the identical organ of different animal species (including man) are biologically similar. We could make a similar statement about any of the approximately 200 types of cells of human or animal body. This scientific "principle of organo-specificity", described in German and Soviet/Russian literature decades ago, is still an unknown term in Anglophone medical journals. There are no antigenic differences between the corresponding cells of the identical organ of different animal species, including man. This is another proof of "organospecificity". All biological systems in nature are composed of the same types of molecules. Great majority of proteins from different organisms, including man, are similar over the entire amino acid sequence, i.e. they are homologous of each other and in general carry out similar functions. The homologous proteins evolved over billions of years from a common ancestor, and logically established a "principle of homology"
The basic law of molecular biology, whereby DNA directs the synthesis of RNA, that in turn controls the assembly of proteins, applies to all living beings. Genetic encoding is the same in most known organisms. Families of similar genes encode proteins with similar functions. All that implies that life on earth evolved only once. The described scientific data explain why it has been possible to implant live cell transplants prepared from sheep, cattle, pigs, horses, rabbits, and probably other mammals, in 5 million patients over the past 70 years, without any serious consequences for individual patients or mankind. Clinical xenotransplantation of cultured pancreatic islet cells originating from pig fetuses, the first in the world, was performed at RITAOMH in 1981. Besides pig fetuses, also adult pigs, cow fetuses, and later, fetal and newborn rabbits have been used by RITAOMH. It is obvious that there is a full compatibility between cell xenotransplants of rabbit origin and transfer factor of rabbit origin and that these transplants are ideally suited for humans.